Imagine this, you’ve just returned from an event and you’re walking back to the street where you parked your car, still happy about the fact you managed to find free on-street parking close to the venue! However, you’re welcomed with a big shock because there’s a large dent sat in your bodywork, that definitely was not there when you left. You rack your brain for anywhere you know that does dent repairs but come up blank, so you give it a quick google search and come across something called paintless dent removal (PDR). What do you know, you’ve actually just clicked on this article and you’re about to find out what PDR actually is! So, What Is Paintless Dent Removal (PDR)? The name of this procedure pretty much tells you what it is, it’s a method in which dents are removed without damaging the manufacturer’s paintwork finish, thus resulting in no re-sprays or paint fillers. To elaborate, the dented panels are smoothly massaged and manipulated to remove the dent, with the use of specialist dent repair tools. With patience and concentration, this can be achieved without cracking or peeling the paintwork, which will result in the best finish! Compared to the traditional dent repair services, paintless dent removal is quite a popular option due to it being less time-consuming and effectively cheaper. When you remove the tedious steps of using body fillers, finding the right paintwork colour and re-painting, PDR can essentially be finished within a couple of hours. What Does The Method Of Paintless Dent Removal Entail? Paintless dent removal is a method which must be performed by trained specialist technicians, as the job requires a meticulous approach due to the dented panel needing to be precisely manipulated to return to its original position. Using specialist tapping tools and rods, the panel is gently massaged until the dent is gone. As expected, a deeper dent will need to be mended in steps. The technicians will use an LED light that will reflect off the panel, thus it will reveal all the different contours in it, to allow them to get a flawless finish. You Save Money – Paintless dent removal is more cost-effective than traditional dent removal services, due to there being no need for repainting. Less Time-Consuming – Compared to the lengthy period of time a conventional dent repair service would take, paintless dent removal requires less repair time. This is due to there being fewer steps involved in PDR, as opposed to the time-consuming process of having to wait for the paint and primers to dry during the traditional procedures. If you have a busy schedule, you’ll be happy to know there’s a good chance you’ll get your car back the same day! Avoid An Insurance Claim – It’s always better to avoid claiming through your insurance when not necessary, as it makes more sense to just pay for paintless dent removal, instead of paying a steeper price just to cover the insurance excess whilst claiming. In this scenario, you avoid risking any unprotected no claims bonuses! Fix Any Size Dent – Whilst this procedure is more suited for those great, shallow dents in your bodywork, paintless dent removal can be used to repair those small, annoying dings you collect from careless drivers and passengers and their poor door handling. No Hassle With Colour Miss-Matches & Runs In The Paint – You won’t have to worry yourself with finding the correct shade of paint for your vehicle because like the name illustrates, it’s a ‘paintless’ dent removal service. So there’s no need for touch up’s or repainting and your original paintwork remains! Can Be Used As A Step In Other Dent Repairs – With conventional dent repairs there is usually sanding and filler steps involved, however, sometimes paintless dent removal can be used at the beginning of the procedure to push and straighten the dent out, to prepare it for repainting and to reduce the use of the other steps. A common referral to this method is ‘push to paint’. Maintains Your Vehicles Resale Value – If you ever think of selling your car in the future and you decided against repairing any minor bodywork damage, then brace yourself for these damages to be the reason you may have to sell your vehicle for a lower price than you wanted. 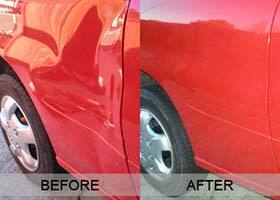 So, prevent this from occurring and choose the cheap and quick paintless dent repair service to have the value of your car increased in no time. There are also other ways to increase your car’s resale value, for more information check out our article: I Want To Sell My Car – How Can I Increase Its Value? It’s A Popular Method – This particular technique is quite established amongst leading car manufacturers; thus it is quite popular. So, with the reassurance that this is an approved method, you shouldn’t have second thoughts about getting it done for any bodywork dents you have collected. Are you sold on paintless dent removal yet? If so, then book your car in with Bodyteq today, our specialist technicians will have your car looking showroom ready in no time, as we always strive to deliver the best results for our customers. However, paintless dent removal isn’t suitable for all dents, so if you require traditional dent repair work involving body fillers and re-sprays, we also offer this service! If you’re interested in finding out more about this service, give us a call on 0207 998 4712. Tags : Paintless Dent Removal, Paintless Dent Removal (PDR), Paintless Dent Repairs, What Are The Benefits Of Paintless Dent Removal?, What Is Paintless Dent Removal & How Does It Work?, What Is Paintless Dent Removal?